Sandbox? No, it’s a ricebox. Rice is usually thought of as just food, but it can be so much more than that. The texture is something that kids just love and shifting it through your fingers is a lot of fun. You can use it as is, but to really have some fun, add a little color to your rice. The process is quite simple. 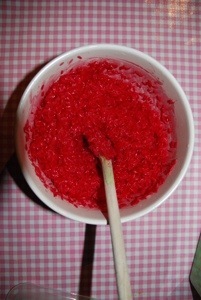 I’ll show you how to make any color you want, as well as a few fun ideas for using your colored rice. I make this up for Maxi- and Miniman to play with and use in crafts, but it`s not my idea . . . Again Pinterest is a great source. I saw a pin of someone making an indoor sandbox with far less mess than real sand! It’s very easy to just sweep the spilled rice up when your little one is finished playing. The best rice for coloring is one that is very white, since it will pick up the dye better. I used long grain Pandan rice. In a small bowl (metal works best if you don`t want your bowl to be stained), mix a little bit of water of water and 5-10 drops of paste food coloring, depending on how strong the color should be. And depending of the quality of food coloring you use. You can also use natural dyes. For the red color I used beet juice. Stir with a (metal) spoon until the coloring is dissolved in the water. Next, add rice and stir until the grains have all absorbed color. Let the rice sit for 5 minutes, stirring occasionally. Drain the water off and spread the colored rice out on a couple of paper napkins or a newspaper (make it several layers thick to absorb any excess liquid) to dry. I let mine dry overnight. You can repeat as many times as you like with different colors. 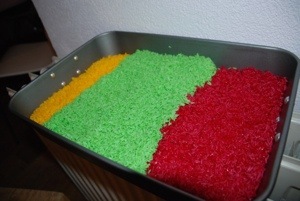 Here I used 3 different colors, but you can do more and make a rainbow of rice. To fasten the drying process, I shifted the colored rice from the paper napkins onto a baking tray and let it dry on the heater. Now that you`ve got your bright colored rice, you`ll want to keep it in a safe place until you`re ready to use it. I like to store it in a plastic box with lit. Kids WILL mix the colors, so if you want to keep them separate, make sure you only offer one color at a time. For putting out multiple colors at once, egg cartons are perfect, just spoon one color into each cup. The colored rice should keep indefinitely. Of course depending how the children play with it. Instead of using sand, you can give your child rice to play with. Dump plain white rice into a large plastic box and add colored rice to make it a bit more interesting. Then, hand your little one some measuring cups and spoons and let him or her practice pouring, scooping and spooning, it`s a lot of fun! 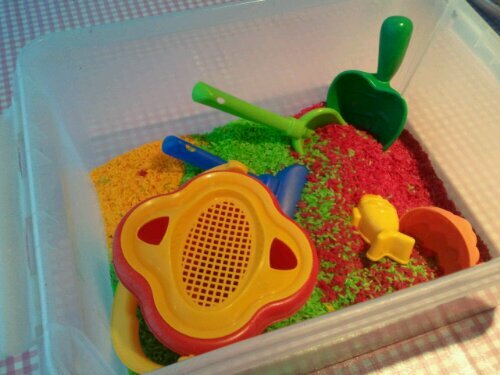 While you can use your regular kitchen utensils, if you prefer to keep those for yourself, try some sand toys. 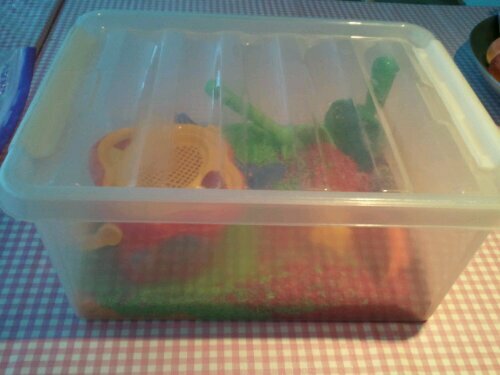 Your little one will be able to play happily with the rice and the toys can be stored right in the same bin. What Else Can I Do With Colored Rice? The possibilities are endless! Here are a few ideas to get you started. Layer colors in a jar. You can make pretty decorations by simply layering colored rice in a clear glass jar and setting it on the shelf. Use as confetti. You can add rice to a birthday card envelope or piñata for an extra bright welcome. Make art. Spread glue on a sheet of paper and then sprinkle with colored rice for a neat effect. Colored rice mosaic. 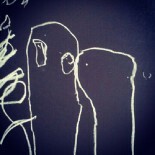 Take a very thick piece of paper and used white glue to draw a design, one part at a time. Then give your little one, one color at a time to sprinkle on the paper. After each iteration shake the paper over a small box to collect the rice that falls off. Use for seasonal art and crafts. Green and red rice for Christmas art, white, red and blue for American 4th of July, red, white, blue and orange for the Dutch Queensday. And so on. You can use this rice in a number of craft applications, glueing it onto art, adding it to kid jewelry, etc. I`d love to hear what you come up with! This entry was posted on February 10, 2013 by The Art of Home Education in Arts & Crafts, Playtime and tagged 3 color rice, Add color to rice for crafts, colored rice, Coloring rice, Coloring rice to play with, dying rice, dying rice for crafts, dying rice with food coloring, Fine motor skills, home education, Homeschooling, How to Color Rice activities, kids dyeing rice, play, play with rice, rainbow rice, rice confetti pasting for nursery, ricepit, sandpit, sensory box, Sensory play for children.